Many times when machinists look at cutting tool speeds and feeds, they are often misled into believing that they should be concerned with horsepower. The real driving force is not horsepower, it’s TORQUE! Torque is the measure of how much immediate rotational force a spindle drive motor can generate. Many times when machinists look at cutting tool speeds and feeds, they are often misled into believing that they should be concerned with horsepower. The real driving force is not horsepower, it’s TORQUE. In order to maximize your speeds and feeds you should have a good understanding of how your CNC machine develops and holds torque. Torque is the measure of how much immediaterotational force a spindle drive motor can generate. The image at the right shows Relationship between force F, torque τ,linear momentum p, and angular momentumL in a system which has rotation constrained in one plane only (forces and moments due to gravity and friction are not considered). Traditionally, a larger diameter 1” end mill would require high torque and low speed (SFM /RPM), while a 1/4” diameter end mill would require low torque and high speed (SFM / RPM). Generally, different end mill diameters & geometries have different requirements for both horsepower and torque. As a general rule our end mills are designed to be run at high RPM regardless of diameter. We prefer high speed AND high torque. 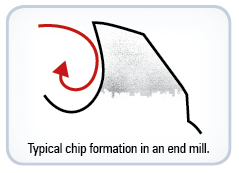 They form a chip differently than the "Old School" end mills. In order to get the chip to "lift" you have to feed it more material. 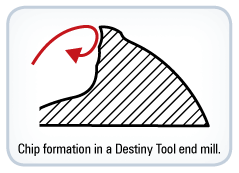 Our tool geometry is optimized for high speed machining. As you can see from the diagrams above, we depict how our tooling geometry on our end mills can have up to 3 rake faces on the cutting edge of the tool. As the tool enters the cut and takes the first 3-5 revolutions (and remember you can be running up to 18,000 Revolutions Per Minute) to create a fully formed chip. There is a tremendous amount of cutting force placed upon the tool and you will notice that your HP meter jumps as the tool enters the cut multiple times. This tool entry is when the torque curve on your CNC machine is the most important. Older CNC machines where designed to quickly reach peak torque between 1200 - 3000 RPM and then drop off. Newer, high speed machining centers hold constant torque. 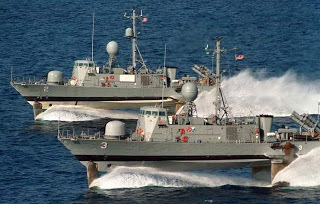 Think of it like this: Hydrofoils! When a hydrofoil starts off from the dock it's not up to speed so it requires both HP andtorque until the hull of the boat lifts off the surface. At that point a couple important changes happen in power consumption because the ship has "lifted" from the surface: The coefficient of friction has dropped dramatically. Similarly, once our tools are "in the cut" the chip formation "lifts" from contact with the gullet of the tool (the 'core diameter"). Horsepower is not quite as important as maintaining torque in the cut especially as you interpolate around a corner in a full slotting application. Our end mills can have up to 3 rake faces in the cutting edge of the tool. As the tool enters the cut and takes the first 3 to 5 revolutions (and remember you can be running up to 18,000 Revolutions Per Minute) there is a tremendous amount of cutting force placed upon the tool. You can notice your HP meter jump as the tool enters the cut multiple times. This entry is when the torque curve on your CNC machine is the most important. Older CNC machines where designed to quickly reach peak torque between 1200 – 3000 RPM and then drop off. Newer, high speed machining centers hold constant torque. Because of the unique geometry, our tools perform best under constant torque. Take a look at the torque curve for your CNC machine. If you have a 10,000 RPM spindle motor and the torque drops from it’s constant peak at 8200 RPM, then 8200 RPM would be the maximum RPM. Take this into consideration FIRST when calculating the specific speeds and feeds listed in this catalog.